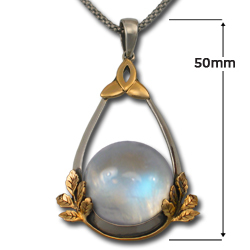 Advertise your love and admiration for Mother Nature by wearing our ethereal Silver & Gold Moonstone Vine Pendant. 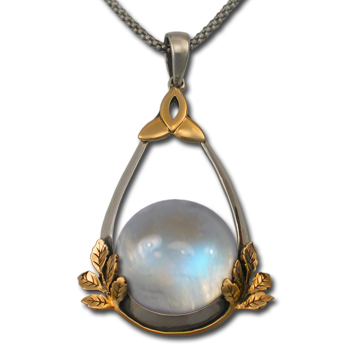 A radiant 12mm moonstone cabochon is cradled in a unique and intricate leaf-detailed elliptical setting composed of both silver and 14 karat gold, and it's compatible with both gold and silver chains in any style. An elegant piece that celebrates earthy opulence!